For a German guy, Roland Emmerich has demonstrated an unusual interest in American history, government and iconography. Or in blowin’ it all up, anyway. The director of Independence Day, Godzilla, The Patriot, The Day After Tomorrow and 2012 returns again to big-budget mayhem involving the destruction of national monuments with White House Down, one of those cheerfully implausible-yet-somehow-not-too-stupid pieces of entertainment that have come to define summertime moviegoing. Beloved movie bro Channing Tatum stars as John Cale, an Afghanistan veteran now working as part of the speaker of the house’s security detail, with eyes on joining the Secret Service. He gets the opportunity to prove how valuable he’d be to the operation when the White House is seized by terrorists while he and his 11-year-old political-enthusiast daughter, Emily (Joey King), are on a tour. With the actual Secret Service incapacitated, it befalls John Cale to rescue the president—played, with his usual aplomb, by Jamie Foxx—from a team of villains with a variety of the usual motivations (money, revenge, etc.). The supporting cast full of familiar faces includes James Woods as the Secret Service chief, Maggie Gyllenhaal as a staffer with old ties to Cale, Richard Jenkins as the speaker of the house, and Michael Murphy (who played the presidential hopeful in the satiric Tanner ’88) as the vice president. 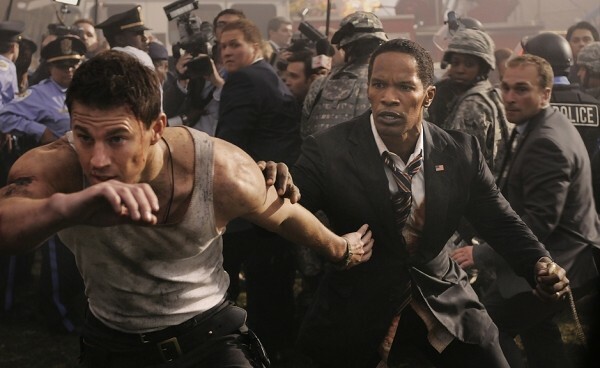 The premise is remarkably similar to that of Olympus Has Fallen from a mere three months ago, but White House Down improves upon it in every category. The other film’s bluntly graphic violence took a lot of the fun out of it; here, in PG-13 land, it’s pure escapism, with an energetic series of action sequences lightened by droll buddy-comedy dialogue, professional-level scenery-chewing by the baddies, and a Channing/Foxx chemistry that is basically a sequel waiting to happen.